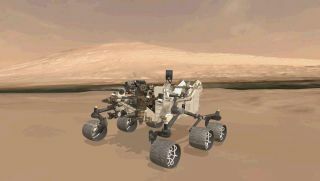 This animation shows the approximate true position of NASA's Curiosity rover on Mars. A 3-D virtual model of Curiosity is shown inside Gale Crater, near Mount Sharp, Curiosity's ultimate destination. For NASA's Curiosity rover, newly arrived on Mars, digging into the menu of minerals available on the Red Planet will take a robotic arm, a sleeve full of soil and a NASA-made tuning fork coupled with X-rays. Curiosity, the centerpiece of the Mars Science Laboratory mission, touched down in Mars' Gale Crater Aug. 5 PDT. NASA plans to use the rover's Chemistry and Mineralogy (CheMin) experiment to explore the chemical composition of this area and figure out how it was formed — with an eye out for signs that Mars once had conditions suitable for life. "If we know the mineralogy (of an area), as opposed to just the chemistry, you can talk about the environmental conditions," Ashwin Vasavada, MSL's deputy project scientist, told SPACE.com. Work will start in the coming weeks when the rover stretches out its five-jointed, seven-foot arm to sample a bit of Martian soil, then swallows it as the arm places the soil inside an inlet. Bigger chunks are filtered out through a sieve, leaving a fine powder that falls into a button-size sleeve with a window on one side. Curiosity will then shine a focused beam of X-rays through the soil. "As (the rays) shine in the different crystals in the minerals, one photon at a time, the rays scatter out," Vasavada said. Curiosity will measure these bent, scattered rays with charge-coupled devices (CCDs). These devices are sensitive to light and are commonly used on Earth in cameras and telescope imagers. Their use in CheMin is quite different, Vasavada explained. The X-rays will shine on the CCD and produce a particular pattern due to the way the light was bent around the crystals. Every type of mineral has a distinctive set of "rings" seen in X-rays, almost like a fingerprint. NASA, like any good lab, has access to a library of these mineral rings. According to Vasavada, the library is a similar concept to that of fingerprint libraries used by crime scene investigators. "You search your fingerprint library for what minerals and what combinations of minerals match," Vasavada said. "It's the gold-standard way of understanding the mineralogy of a powdered sample." NASA has used similar techniques on Mars before, but this time it has devised a way to greatly improve the accuracy of the analysis. Each sample envelope is attached to a metal strut similar to a tuning fork. As the X-rays shine through the envelope, the strut will vibrate at 200 cycles a second to mix up the Martian soil. Shaking the sample increases the number of ways in which the crystals orient toward each other, improving the analysis. The vibration also makes a noise: "It sounds like a mosquito when you do it," Vasavada said. Some of the minerals that could show evidence of what NASA calls "biosignatures" — telltale signs of life — include silica, sulphates, carbonates and phosphates. With each X-ray fingerprint, researchers can get a little closer to figuring out if Gale Crater once had conditions where life could have thrived. Visit SPACE.com for complete coverage of NASA's Mars rover Curiosity. Follow SPACE.com @Spacedotcom, on Facebook and Google+.